Media companies do not tend to talk about each very much, just like McDonald's does not discuss the merits of Wendy’s hamburgers. They are competitors so the least said about the other guy the better. 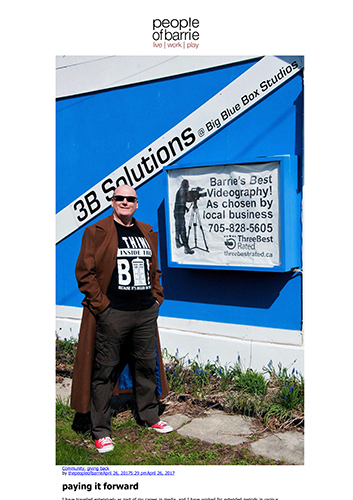 Regardless, the introduction of Five Points Media has attracted considerable interest from media both in Barrie and beyond. The main reason is that we are Canada’s only known social enterprise media company that is focused on our community and charity. Our focus is community support, not profit, so we are different than most mainstream media. We also want to report on local events and focus on our community at a time when the big mainstream media companies are negotiating with the CRTC to do less local reporting. Community access by cable companies used to be required, but now it is being whittled down yearly. Barrie is unique in that we are now very much a feeder city to Toronto, yet we still maintain our own character and identity. Most of us do not want to be absorbed into the GTA, as has occurred with Mississauga and even cities as far away as Oshawa. Nonetheless, the big broadcasters have ignored our desire for a truly independent on-air identity, and every day we inch closer to becoming just another link in the network of stations rebroadcasting Toronto news and programming. It is reported that both of our region’s cable stations will soon be able to cease local programming, and that the local broadcaster is negotiating to act as a relay for Toronto. Without a local media source, our community will wither and dry up as so many others have done before us. Five Points Media strives to present the local voice, and we want to tell local stories. All members of our crew were born in Barrie or we have lived here a very long time. Barrie is our home, and we don’t want to see it lost to the profit ledgers of mainstream media, whose only interest is profiting from peddling stories from the big cities to as many people that they can force feed it to from other regions. Our crew has helped the Women and Children's Shelter of Barrie quite a bit during the past four years, both under the banner of 3B Solutions and Five Points Media. 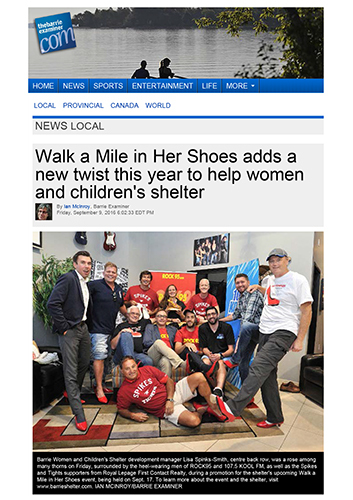 So, when the official promotional picture for the annual 'Walk a Mile in Her Shoes' event was to be taken by the Barrie Examiner we were asked to join them at Rock 95 along with the other primary commercial and media sponsors. 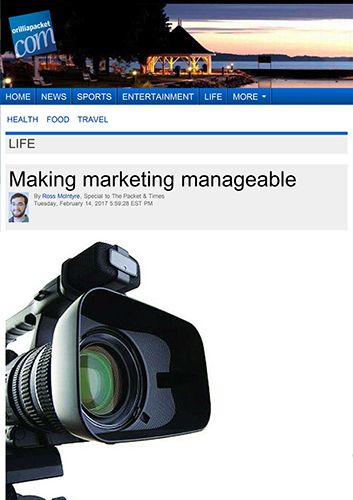 Our donated video was also featured within the original story published by the Barrie Examiner. During the winter of 2016-2017 our crew did a lot of work in the Orillia area, producing a promotional video and explanatory video for SY-STEM Links, a promo for Beneath the Blanket, another for the Coldest Night of the Year fund-raiser, and another for the Lighthouse Soup Kitchen and Shelter. Over time our name came to be known. Then in the spring we recorded Frank Nelson's speech to students and faculty at Georgian College Orillia Campus. Shortly after we were approached for this article. Few will deny that our producer, John Ironside, is unique; as is often true of creative people. Despite his professional history of working in international news, private investigations, and documentary production, where he exposed some of the more unpleasant aspects of life, John is known for being a strong community supporter and a believer in people. Where many see darkness, he finds a reason for why there is at least a strong probability of re-finding the light. That optimism was the reason for this article. We also provide to mainstream media live and in-the-field reports from the community and charity events we cover. One example is this photo of Ashleigh Beacham swimming across Lake Ontario in 2013 that was taken by our producer, John, in the middle of the night from a zodiac inflatable boat. Using specialized equipment, we were able to send this picture directly to the London Free Press from miles off shore, allowing them to publish it the day Ashleigh completed her swim. We then expanded upon that kind of live reporting when Brenda Lussier, the Deaf Swimmer, challenged the same lake in 2017. The resulting documentary about Ashleigh Beacham's swim was completed in two parts, with the first focusing on the preparation for the swim, and the second focusing on the swim itself.